Today Google is rolling out a new version of its eponymous app for Android through the Play Store. 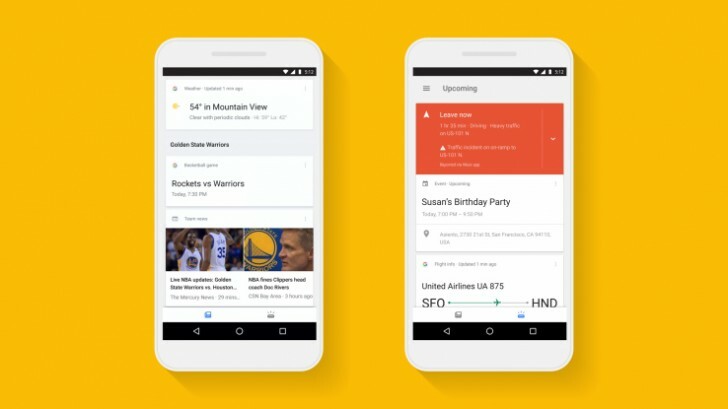 The new iteration of the app comes with a revamped Google Now feed of cards. While previously everything would live in the same feed, from this point on you'll get two separate ones - the first for news, the second for your personal upcoming stuff. Both of these will be accessible, as before, when you swipe right on the leftmost homescreen of your device, if you use the Google Now Launcher or the Pixel Launcher. Except the cards in there won't be randomly thrown together as before, but they will be under two different headings - Feed (for the newsy stuff and keeping up with your favorite sports teams, things like that), and Upcoming (for your daily schedule, commute info, package delivery, flights, and so on). You switch between the two by tapping on the appropriate icon at the bottom of the feed. The update that enables the new functionality is coming to iOS soon. Over on Android, if you're in the US you'll get an additional way to tell Google what you care about, in order to receive a better tailored experience in the app. This will happen through a dedicated card in the feed, which will let you select topics of interest. The card should make its way to other countries "in the coming months".